Avoderm introduces the new Revolving Menu Diet! Dogs enjoy variety as much as people, but tend to get an upset stomach from rapid food changes. 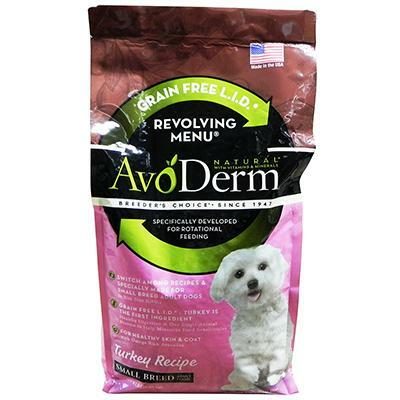 This food is specially formulated to allow variety rotational feeding for Adult Small Breed Dogs. Using consistent protein and starch levels throughout the different recipes allows for switching it up! 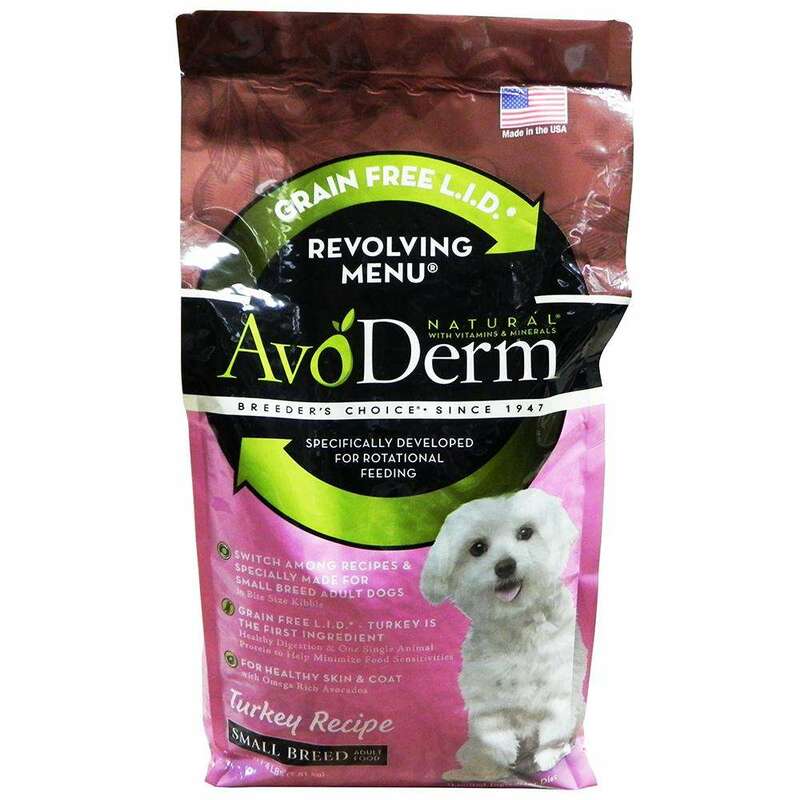 This food is ideal for dogs under 20 lbs. Comes in Beef, Lamb, and Turkey! Ingredients: Turkey, Turkey Meal, Peas, Garbanzo Beans, Pea Flour, Tapioca, Chicken Fat (Preserved with Mixed Tocopherols), Avocado, Natural Flavor, Alfalfa Meal, Flax Seed (Source of Omega 3), Dried Plain Beet Pulp, Dried Chicory Root, Salt, Potassium Chloride, Kelp Meal, Vitamins (Choline Chloride, a-Tocopherol Acetate (Source of Vitamin E), Niacin, Calcium Pantothenate, Vitamin A Supplement, L-Ascorbyl-2-Polyphosphate (Source of Vitamin C), Pyridoxine Hydrochloride (Source of Vitamin B6), Thiamine Mononitrate (Source of Vitamin B1), Riboflavin Supplement, Vitamin B12 Supplement, Vitamin D3 Supplement, Biotin, Folic Acid), Minerals (Zinc Sulfate, Zinc Amino Acid Chelate, Ferrous Sulfate, Manganese Sulfate, Manganese Amino Acid Chelate, Copper Sulfate, Copper Amino Acid Chelate, Sodium Selenite, Calcium Iodate), Avocado Oil, Yucca Schidigera Extract, Rosemary Extract, Sage Extract, Pineapple Stem (Source of Bromelain), Papain, Dried Bacillus Subtilis Fermentation Product, Dried Aspergillus Oryzae Fermentation Product. Vitamin E 125 IU/KG Min. Ascorbic Acid* 25 MG/KG Min. Omega 6 Fatty Acids* 2.10% Min. Omega 3 Fatty Acids* 0.60% Min.